« Why have media extenders failed to take off? It’s October, and you know what that means. No, not the World Series. Hulu, the joint online video venture between News Corp. and NBC, is scheduled to make its grand entrance, at least in beta form. The question is: Is Hulu too late? Shira Ovide explores this question for SmartMoney, noting that in the six months since the formation of the site the now-named Hulu may have lost its “cache” and become “irrelevant”. During these six months, the networks — including Fox and NBC — have done a bang-up job getting shows on their Web sites for quality streaming, even though there is room for improvement. The networks also have been exploring other means of distribution for their content such as Apple’s iTunes store, Amazon’s Unbox, even Wal-Mart, and have been firming up their digital technologies and strategies. 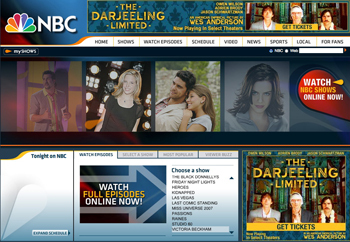 NBC even launched NBC Direct, where people can download ad-supported TV programs for free. With all this activity, many pundits are asking if there is a need for another online video site and how Hulu fits into the broad Internet strategies pursued by the networks. Hulu remains a work in progress and is a bit of a mystery as it’s keeping details under wraps. When available, Hulu is expected to show full videos of TV series and short TV and movie clips from News Corp. and NBC properties, as well as other television networks. Owners of those other networks, including Viacom (MTV, Comedy Central, and Paramount Pictures), Disney (ABC), CBS, Time Warner, TBS, TNT and others, have not signed on yet. It’s like they are taking a wait-and-see stance. If Hulu is successful, they sign on; if not, bye bye. Hulu, touted originally as the next YouTube, has said users might see better-quality video and an improved way to slice-and-dice video clips for personal use. Its user experience must be better than the network sites, or why would one choose to watch “The Office” or “My Name is Earl” on Hulu instead of the NBC site for streaming? “Otherwise, as Sharpe said, “In 18 months it will be ‘Hulu what?’” – applies to everyone of the videos sharing sites out there. – Richard forgets to mention HCP portfolio – Metacafe and Gotuit both of which will be challenged – let’s see where they go in 18 months!! 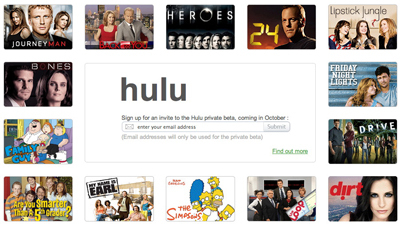 As for Hulu – unless they actually launch – no one will ever know. I welcome any additional competition to this market…till it matures.